We often hear from landscape architects about the cutting-edge sustainable design practices they are bringing to their latest Sustainable Sites Initiative™ (SITES®)-certified works, but we rarely hear from their clients. In a session at the ASLA 2013 Annual Meeting in Boston organized by Liz Guthrie, ASLA, professional practice manager at ASLA, landscape architects and their clients together discussed their motivation to become certified Sustainable Sites Initiative (SITES) projects, the challenges involved in working with this new 200-point rating system, and the lessons learned. 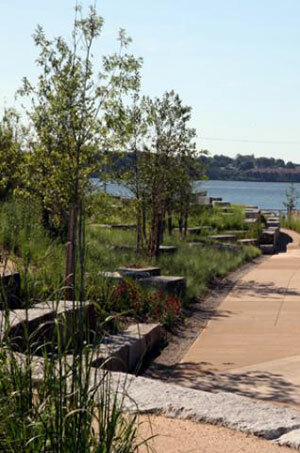 In the Bronx, Hunts Point Landing, a two-star SITES-certified landscape developed by the New York City Economic Development Corporation (NYCEDC) and designed by Mathews Nielsen Landscape Architects, shows how a “dead-end” in an isolated and unhealthy neighborhood can be turned into a park, said Kate Van Tassel, NYCEDC. The park is meant to ameliorate some of the health problems in the community, which has some of the highest rates of asthma and obesity in New York City. 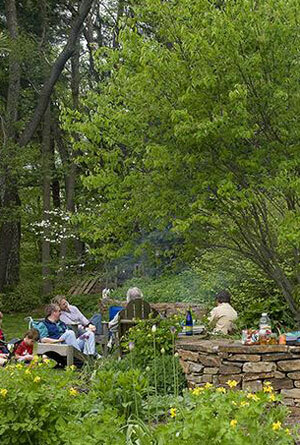 In the case of Taylor Residence in Chester, Pennsylvania, Margot Taylor, ASLA, is both the client and landscape architect. Taylor wanted to create a public demonstration project for sustainable landscape best practices on her own property. Her property includes wood systems and meadows. Ecological systems were re-established, with a focus made on soil and plant health. The landscape, which used to be a farm, now “directs, holds, absorbs, and cleans water.” She now has hundreds of people, including lots of school groups, touring the landscape each year. Representing both himself and his client, Hunter Beckham, ASLA, SWT Design, described the design of the Novus International campus in St. Charles, Missouri. He said a “huge number of stakeholders” were involved in creating a sustainable campus, which was designed to yield many benefits for both employees and the environment. There’s a productive, edible landscape: a vegetable garden with bee-friendly plants. There are two bee blocks that provide home to seven different local species. In the first year, the landscape yielded 65 pounds of honey. This vegetated garden terrace is accessible via a walking loop that circles the entire campus. 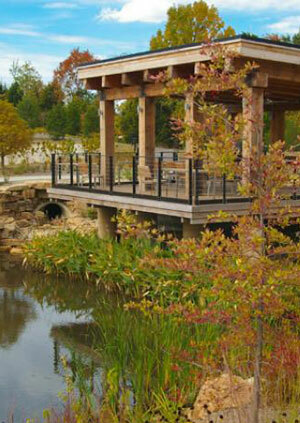 The loop enables both employees and visitors to take a break from the office and get out in nature. Within the landscape, an old concrete-lined water detention pit was turned into a natural water habitat that manages stormwater and attracts a wide range of wildlife, including snakes. For Jose Alminana, FASLA, a principal at Andropogon and one of the guiding forces behind SITES, the benefits far outweighed the challenges. 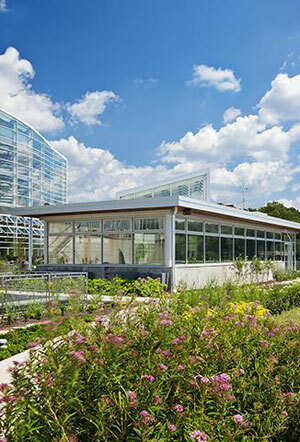 He said achieving 4-stars for the Phipps’ Center for Sustainable Landscapes was no small feat, but perhaps made possible by the fact that “we started with no site.” The design team then had “complete control over the materials used,” which helped them improve site performance and earn points under SITES. For Signe Nielsen, FASLA, SITES seemed to be an exercise in frustration. She said there were three categories of SITES credits that deeply-urban brownfield sites like Hunts Point Landing “couldn’t take advantage of,” so the project could only get two stars. She added that working with public authorities, in effect, means “limited opportunities for integrated site design teams,” as many local governments don’t incentivize such groups. Urban public projects may have a challenge earning maintenance points as well, as the landscape architecture firms creating these projects often have “no control over future maintenance.” A firm could create a detail maintenance manual for a park, but then that’s it. Taylor learned that it’s important to “integrate a long-term land management perspective from the beginning,” something that SITES promotes. The landscape architects all hoped that governments — both local and national — will get moving on incorporating SITES guidelines into their request for proposals (RFPs), which can also help push the landscape materials industry to provide more sustainable options. It will be a back-and-forth process to make SITES more mainstream: landscape architects, and their clients, must push for change among providers of landscape materials, but the market must also provide opportunities to enable that change.